Although Maldives is a small country with small population they can challenge India and Sri Lanka in football. They have good 8 professional clubs playing in their domestic tournaments. Some of Sri Lankan Players are also playing for these clubs. In 1990’s Roshan Perera and Amunulla played for Maldivian Clubs. Now Maldivians Learn their lesons well, Maldivian team is too tough for the Sri Lankan team. Sandun Devinga is New Radiant’s Forign player he is the Goal keaper of Sri Lanka Football team too. Here let me post some information about these Maldivian Football Clubs. Club Valencia is a Maldivian football club based in Male, Maldives. It is very popular in Maldives. They have 10 Dhivehi League trophies in 1983, 1984, 1985, 1994, 1998, 1999, 2001, 2002, 2003 and 2004. VB Sports Club is a professional football club based in Male. VB Sports Club is the former Island Football Club acquired by a leading entity and renamed on 8th November 2006. The transition & formation of VB sports club is all very new, but the name VB & the team won’t be a surprise to the Maldivian football community as the team comes with the most gifted & famous players in the nation. The Hungarian born coach is a very reputed coach in Hungary and in Maldives. Kiss, who brought enormous success to Valencia during his times as a coach, left Maldives repeatedly saying that he will never return Maldives to coach a local club. Ogbodogbo Onome Peter of Nigeria is their forign player. Chairman is of the club is Hamid Ismail. Manager is Lazloa Kiss of Hungry. Villingili Youth and Sports Association is a Maldivian sports club best known for its football team. This is based in Villingili. Victory Sports Club is a Maldivian sports club best known for their football team.The team has won titles that no other team can match. Aguirre Daniel Marcos and Theiler Luciano of Argentina playes Victory football Club. Jorge Armando Rodriguez Arguello is another non Maldivian player in Victor Club. Club Chairman is Ibrahim Rasheed. New Radiant Football Club of Maldives based in Male. The club was founded in 19 Ausust, 1979 and is one of the most popular football team among the Maldivians. The club is the most successful football club in Maldives, in terms of trophies they have won and is the most successful Maldivian team in international arena. They were quter finalist in 1995 and 1996 in Asia Cup winners cup. They were the semi finalist on AFC Cup 2005, Inside the country they have won dhivehi league six times,FA cup 10 times out of 20 and have won the cup winners cup several times. The chairman is Ali Azim. Current Coach is Gerd Zeise. Valtiem Jukka is a Finland player who playes for New Radiant Club. VB Sports had two Hungarians other than Peter of Nigeria. Club Valencia has two Hungarians plus a Cameroon strickers. Ibrahim Shiyad Gasim who was elected lately. Mukhthar Naseer is a Maldivian footballer. He is in his 30’s now. He currently playing for Club Valencia in the Maldives. 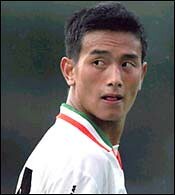 He scored the winning goal for the Maldives against India in the final of the 2008 SAFF Championship. Mukhtar is from Thoddoo, Alif Alif Atoll. He was first noticed while playing for Rasdhoo football team in zone football tournament by Laszlo Kiss and he brought Mukhtar to Valencia. Ibrahim Fazeel is another player of Maldives Football team. His current club is Victory Sports Club. His number is 23 and playing as a Forward in Maldivian National team. Imran Mohamed is a Maldivian proffesional footballer who is a goalkeeper for Victory SC. He is a member of the Maldives national football team. These Blogs are related to maldives. Their topics are various. Sports, Travel, Technology, Fashion and Many more. Just load them on your brower, Very intresting blogs. Dhivehi League is the official Championship of Maldivian football. Dhivehi League is organized by the Football Association of Maldives. India prepares to take on Tajikistan in the final of the AFC Challenge Cup football tournament at the Ambedkar Stadium. The match carries a lot of significance for the home team. A win tomorrow would mean India plays the Asian Cup in 2011 in Doha. India last played the Asian Cup 24 years ago. Tajikistan held India 1-1 in a group stage encounter. India beat Syria to lift their first major title in 23 years. India’s SAFF Cup performance in June was dismal and they lost to Maldives in the final. However on Wednesday, they will be looking to put the disappointment firmly behind, and go all out for a victory to earn a place in the 2011 Asian Cup after a span of 24 years.